Scientists become trapped in a theme park of genetically cloned dinosaurs. Dennis Nedry:"Don't get cheap on me Dodgson." John Hammond:"This is just a delay. That's all it is. All major theme parks have delays. When they opened Disneyland in 1956, nothing worked." Dr. Ian Malcolm:"Yeah, but, John, if The Pirates of the Caribbean breaks down, the pirates don't eat the tourists." Donald Gennaro:"Hey, where did you find those?" Tim Murphy:"In a box under my seat." Donald Gennaro:"Then they're expensive. Put them back." Lex Murphy:"Are, are those meat eating, uh meat-a-saures?" Dr. Ian Malcolm:"That is one big pile of ****." Dr. Alan Grant:"Big Tim, the human piece of toast." 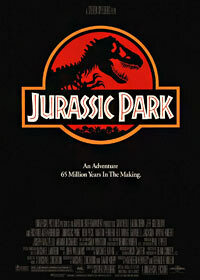 Dr. Alan Grant:"Well maybe dinosaurs have more in common with present day birds then they do with reptiles. Look at the pubic bone. Turned backwards, just like a bird. Look at the vertebrate, full of air-sacs and hollows, just like a bird. And even the word, 'Raptor' means 'bird of prey'." Volunteer Boy:"That doesn't look very scary. More like a six foot turkey." Dr. Alan Grant:"A turkey, huh? Ok, try to imagine yourself in the Cretaceous Period. You get your first look at this 'six foot turkey' as you enter a clearing. He moves like a bird, lightly, bobbing his head. And you keep still because you think that maybe his visual acuity is based on movement like T-Rex. He'll lose you if you don't move. But no, not Velociraptor. You stare at him, and he just stares right back. And that's when the attack comes. Not from the front, but from the side, from the other two raptors you didn't even know were there. Because Velociraptor's a pack hunter, you see, he uses coordinated attack patterns and he is out in force today. And he slashes at you with this. A six inch retractable claw, like a razor, on the the middle toe. He doesn't bother to bite your jugular like a lion, say, no no. He slashes at you here, or here. Or maybe across the belly, spilling your intestines. The point is, you are alive when they start to eat you. So you know, try to show a little respect."